← Top 10 requirements of a happy office versus working from home! 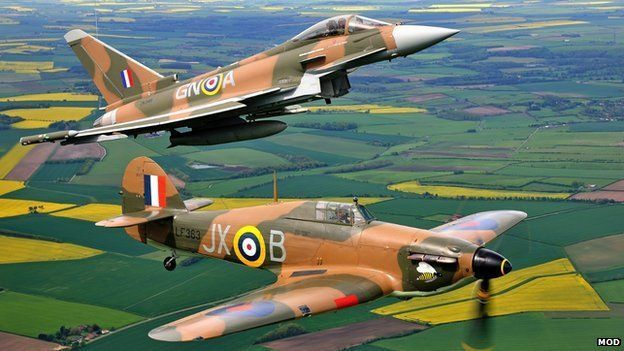 Today marks the start of the 75th anniversary of the Battle of Britain and the skies of London will be treated once again to the familiar sights and sounds of Spitfires, Hurricanes and Lancaster bombers. As strange as it sounds, I think the sound of a Spitfire Merlin engine is possibly the best man-made noise I can think of. I love listening to them fly over every summer and somehow it is very evocative even though I wasn’t in anyway shape or form around for decades after the war finished. It is fair to say that out of all our long history, the Battle of Britain really was one the most significant moments in history. Hitler had never really wanted to fight Britain and in someways he modelled his country on Britain accept he wanted his to be even better and militaristic. Uniquely we entered WW2 when not directly threatened ourselves and when we very easily could have just let the entirety of Europe fall under the Third Reich. The decision is even more stark when it was generally known that after all ready fighting one world war, fighting a second would would likely finish us as the leading world power and so it was a in some ways a suicidal decision, albeit a glorious one. ….However matters may go in France or with the French Government or with another French Government, we in this island and in the British Empire will never lose our sense of comradeship with the French people. If we are now called upon to endure what they have suffered we shall emulate their courage, and if final victory rewards our toils they shall share the gains, aye. And freedom shall be restored to all. We abate nothing of our just demands—Czechs, Poles, Norwegians, Dutch, Belgians, all who have joined their causes to our own shall be restored. What General Weygand has called the Battle of France is over … the Battle of Britain is about to begin. Upon this battle depends the survival of Christian civilisation. Upon it depends our own British life, and the long continuity of our institutions and our Empire. The whole fury and might of the enemy must very soon be turned on us. Hitler knows that he will have to break us in this island or lose the war. If we can stand up to him, all Europe may be freed and the life of the world may move forward into broad, sunlit uplands. But if we fail, then the whole world, including the United States, including all that we have known and cared for, will sink into the abyss of a new dark age made more sinister, and perhaps more protracted, by the lights of perverted science. Let us therefore brace ourselves to our duties, and so bear ourselves, that if the British Empire and its Commonwealth last for a thousand years, men will still say, This was their finest hour. The Spitfires and Hurricanes of Fighter Commander were hugely outnumbered by the German forces that crossed the Channel in their hundreds and thousands with up to 5 times as many German forces pitted against Britain. The whole of Southern England was on red alert as teenager flyers waited for the sirens to sound and madly scramble to their aircraft in order to get airborne and meet the attackers knowing that their chances of making it back in one piece were not high. Luckily, the British had started to implement the very first radar system which gave a few minutes warning of approaching enemy aircraft. The Germans though numerically superior had the disadvantage that they could only spend a limited amount of time over England due to problems of fuel consumption and as always when there is a just defence of any homeland, the defenders were very highly motivated. There were countless stories of RAF men who having been shot down, somehow survived only to go straight back to the nearest airbase and get back in the skies. With guts like that, it would take a a lot for Germany to win. However the attacks were relentless, airfields were being constantly bombed, the surviving aircrews became exhausted whilst many of their number died in action. Similarly the loss of RAF aircraft was increasingly unsustainable and planes were being lost much quicker than what they could be replaced. 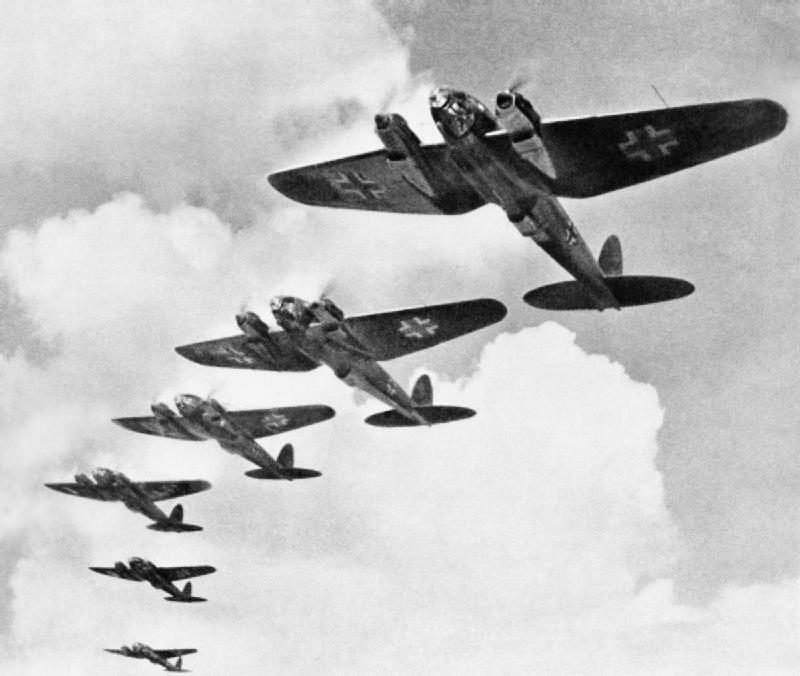 The September 15th deadline for Hitlers invasion of Britain neared and though cowered, the RAF was not yet defeated. Hitler was growing impatient, a successful invasion of Southern England had to take place soon before the weather would begin to turn to winter. After much internal wrangling between Hitler and the Luftwaffe supremo, Goring, German efforts had already been switching to British factories and industrial complexes. German intelligence indicated that Fighter Command had only around 150-300 aircraft left. As such, Germany decided to concentrate its efforts for just a short time on bombing London itself. This was to prove a catastrophic decision on the part of Nazi Germany and though London was devastated, the few short days had provided the vital breathing space that the RAF needed. Unknown to all, it is estimated that if the German tactics had continued for just another 24-48 hours then Fighter Command would have been entirely destroyed. 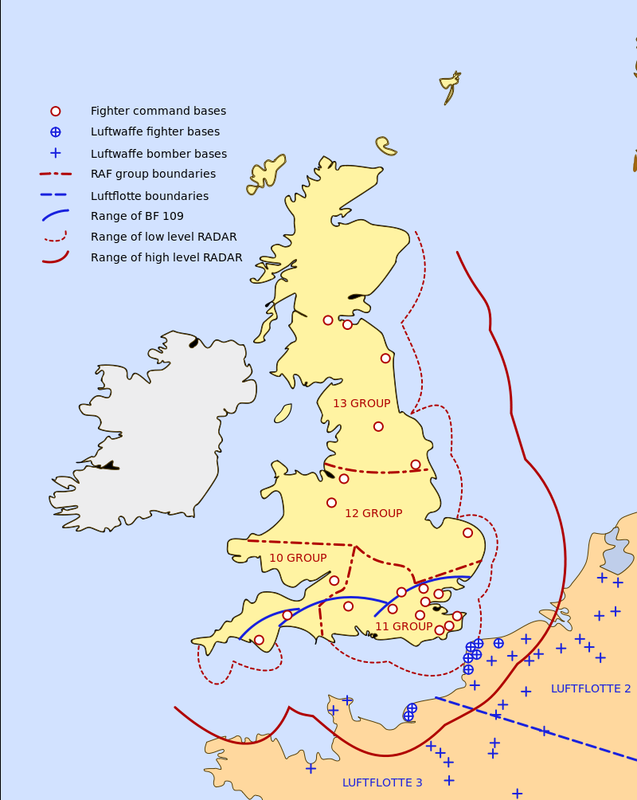 Map showing the radar coverage and RAF airfields during the Battle of Britain. As London was pounded the crews of Fighter Command refreshed and replenished, planes and airfields were repaired and increasing number of new aircraft were shipping out from the factories. On the 15th September the Luftwaffe returned to focusing on the RAF but to their surprise, Fighter Command fought back harder than ever which shattered the German image of invincibility and on 17th September, Hitler realised the RAF were not going to be easily defeated and Operation Sealion was suspended. Indeed by now over 2,500 German airman had lost their lives in the battle, a figure far exceeding those of the RAF defenders. Of course at the time the British public could not know that invasion would never actually come and London and many other cities were about to endure the daily and nightly bombings of The Blitz. 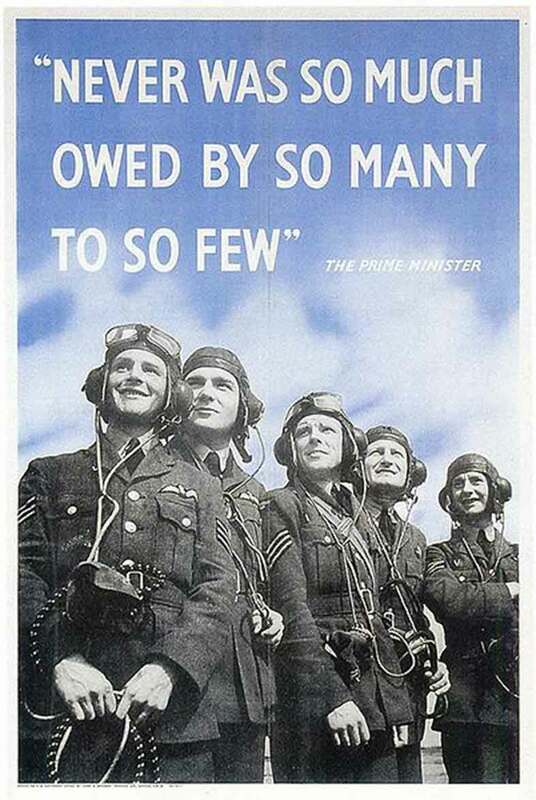 The 3,000 Few of Fighter Command had won the Battle of Britain and in doing so had not just avoided a British defeat but also taken the first vital steps in an eventual restoration of democracy to Europe at a time when France had fallen, Russia was a German ally, the USA was neutral and the forces of Germany and Italy were still expanding across Africa and northern Europe. This was their Finest Hour and in a way it was “ours” too. There are only 30 or so left of the Few who were the only men who stood between a world of tyranny and one of freedom. Their sacrifices were not in vain and did much to persuade Washington that the British cause was not a hopeless one. It’s arguable today just how close Britain came to defeat in the Battle of Britain. It’s very easy to say German tactics were not always thought out. In the very worst scenario, the RAF could have evacuated Southern England and moved to the Midlands. Also with a level head, it is hard to imagine a successful Nazi invasion whilst the Royal Navy had anything to say about it though on the other hand Germany could very well have pushed Britain out of the war and be free to conquer much of the war and develop nuclear weapons. Still, we can imagine today just a little how it must have been when we see the panic that a handful of terrorists can bring which is frankly nothing compared to the might of the Third Reich 20 miles across the English Channel. 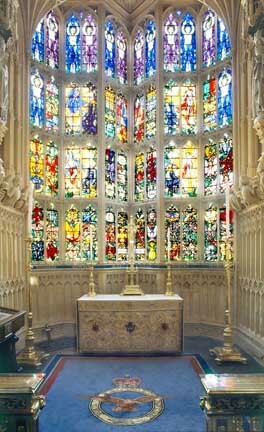 There are a number of great Battle of Britain memorials chief of which is the RAF chapel in Westminster Abbey which is dedicated to all those who fought and died in the battle which we shouldn’t forget included dozens of Polish, Canadian, Belgian and other nationalities as well as 7 Americans and even a Palestinian. My favourite though is at Capel Le Ferne a few miles from Dover. 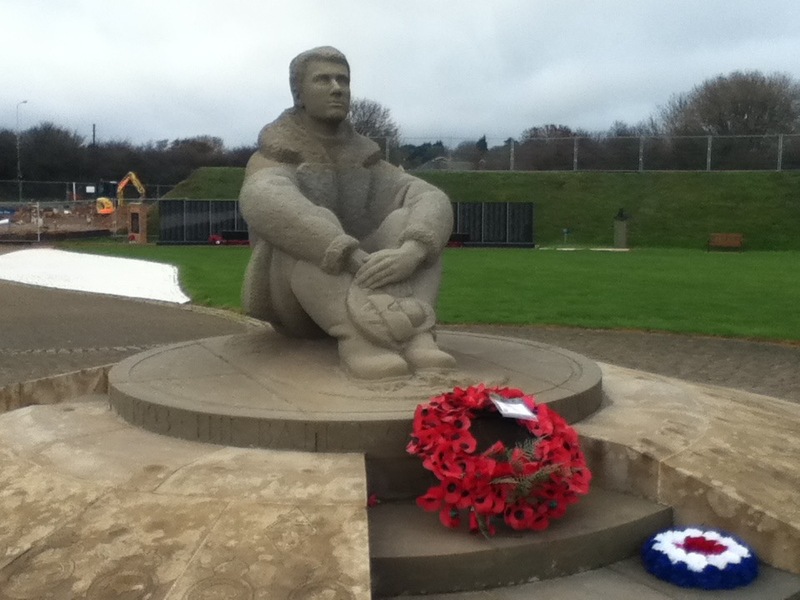 I particularly the statue of his of the RAF flyer who is sitting on top of the famous white cliffs and looking out to sea desperately waiting to see if his missing friend will return home. For those around the world who have never heard Spitfires and Hurricanes then feast your eyes and ears on this! If you liked this post on the Battle of Britain, please have a log of my WW1 history book below. This entry was posted in history, Life, London, WW2 and tagged Battle of Britain, history, Hitler, Lest We Forget, Life, London, Luftwaffe, RAF, Remembrance, war, Winston Churchill, WW2. Bookmark the permalink. This post is totally brilliant. I was so moved it and consider its relevance today. Let us ever descend into a dark aGE again!!!!! Thanks Francis, I always have to be careful on getting the right tone as I don’t want to offend anyone. I’m sure one day I have a WW2 book in me that I can write. Yes with the problems with Greece and single-minded German, an increasingly dodgy Russia, Islamic terrorists and an isolationist UK and USA we all have to be careful. 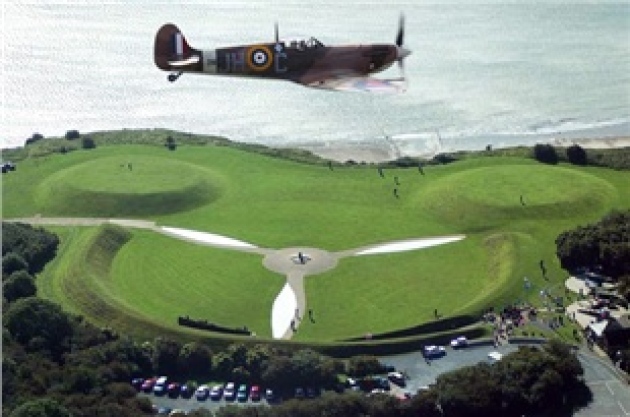 I also found out a really neat Battle of Britain story I will post in a few months! This post is totally brilliant. I was so moved it and consider its relevance today. Let us never descend into a dark aGE again!!!!! 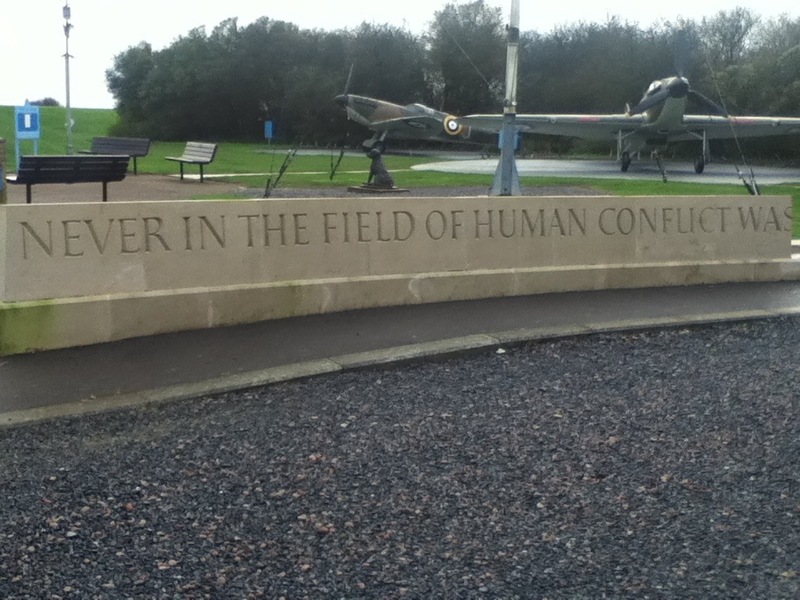 Actually I remember being so moved when I visited the statue of the pilot looking out across the sea to France. Quite an incredible monument and if it is hard to imagine fighting in the war, it is easier to imagine looking out against hope that a lost friend might yet limp home. Great post, Stephen! Gave me goosebumps! I too, love the sound of the old Spitfire even though I was born after the war. I’ve just watched the video again. They sound marvellous. Sometimes I am in my back garden or even the house and I hear the rumble and its always worth trying to see it. Such a great symbol of bravery and defiance, I think it turns all of us into young boys and girls imagining the RAF fighting against the odds.